Ramazan is a one of the holiest months known to all Muslims. In fact, fasting in Ramazan stands as one of the five most important pillars of Islam; it is an essential act which makes up the religion. There are some very clear guidelines on how to act during this month in order for a person’s fast to be accepted and counted as successful. It is believed that during the fast, one should abstain from all bad deeds. A person fasting should not indulge in arguments and disputes nor use obscene language; should not show bad temper, should be pleasant, patient and tolerant. The whole point of fasting in Ramazan is to practice patience and self-control, making oneself a better person in order to better connect with the Divine being. However, every Ramazan, without fail, there is news of utterly heartbreaking incidents which go well beyond and legitimately against the basic principles of Ramazan and of Islam in general. Speaking of practicing patience, I would like to argue here that the amount of road rage I experience during Ramazan, especially close to iftar time, has to be the worst all year round – there is madness on the road with the consistent honking and everyone rushing to get home in time. Recently, there have also been social and legislative moves that have left me questioning states’ tolerance on a larger level. Many Muslim majority countries, Pakistan included, have banned eating in public during Ramazan, with consequences of imprisonment and fine for those who do not comply with the law. In a country where there exist polarised versions of Islam, people in general take it on themselves to punish others accordingly to what they deem is right or wrong. This was evident last year in the case of Gokal Das, an elderly Hindu resident of Hayat Pitafi, who was having Biryani given to him in charity, when a police constable and his brother beat him up for eating in public in Ramazan. Does this brutal act not go against the fundamental ideals of Ramazan? How does a fasting person justify inflicting pain onto another as an act of righteousness? What I find most unfair and problematic about such laws is that they put false compulsions, restricting people who cannot fast or do not want to fast for whatever reason, in direct and unnecessary danger. I am compelled to think about the poor labourers who work day in and day out under the scorching sun, especially during the deathly heat waves, without any sort of air conditioning; I am compelled to think about pregnant women, women who are menstruating, children, students, the elderly and the sick. Most importantly though, what about non-Muslims? Under what Islamic rule are they supposed to get punished for eating in public? What happened to the religious freedom constitutionally promised by the founder of this nation? And what exactly is so wrong with eating in public? For those people who are fasting and get offended so easily at the sight of someone else eating – is your faith so weak that you’re afraid watching someone practice such a basic act of eating will affect your fast negatively? When there is no compulsion enforced in your own religion, how can you force followers of other religions? Many others like myself are asking the same questions. As a result of which, giving Tunisia’s example is of great importance. Last year in Tunisia, dozens of people were arrested for eating in public and what the state claimed to be “offending public decency”. A group of young Tunisians decided to fight back by running a social media campaign and friendly protests, demanding for restaurants to be open during the day so food is easily accessible. The protests are a call for freedom for people to do as they please so long as they are not hurting other people’s freedom. I know I will face backlash for agreeing with the Tunisian protests but I have a counterargument for that: Muslims who make up a minority in other various countries cope with Ramazan just fine. They survive the entire day in workplaces, where most people do not fast and it is completely alright. Many Muslims work at restaurants and food courts at malls while they fast themselves but they know that serving food to others or watching other people eat will not automatically “ruin” their personal choice to fast. Having said that, I do also believe that out of respect, friends and family of the fasting person can consult or ask whether it is alright to eat around them but there should not be any compulsion that altogether rules out another person’s freedom to eat at a location of their choice. Businesses in Muslim minority countries run on a regular basis in Ramazan and I don’t see them failing as a state, nor do I see Islam’s value being compromised there. In fact, in places like the UK, European Union (EU), Canada and the US, fasting hours are much longer than they are in the Middle East and South Asia, and life goes on just fine. I’m a working professional in Lahore and there are many people at my workplace who choose not to fast and others that simply cannot. We respect each other’s decisions because ultimately it is a person’s personal choice. When I am not fasting, I make sure to ask my fasting colleagues whether they are okay with me eating around them, and guess what? In fact, many people don’t. If I am fasting and others are eating around me, I frankly do not care either because I know what purpose my fasts serve and seeing food around me does not encourage me to suddenly give in and eat mid-day and nor does it offend me in any way. I believe that in many Muslim majority countries, there is a certain urge to maintain the “Muslim” identity, but that identity looks very different for different people. That’s why it gets really tricky. In order to maintain the power of religion, such laws are passed so that citizens are constantly under fear to comply. Even if we were to give that logic the slightest benefit of the doubt, it does not justify the unfairness towards non-Muslim citizens and towards people who choose not to fast. Perhaps eating in public during Ramazan, especially in Pakistan’s case should be given less importance and concentrating on teaching people to just be better and kinder should be focused on more. Just last week, there was horrible news of two sons who brutally abused their mother and dumped her in the trash; there was another case of a father who violently beat his daughter; Charanjit Singh, a social worker, an active preacher for interfaith harmony and a diehard patriot was murdered in Peshawar. How is that these acts are not offensive enough to be penalised or criminalised, that too in Ramzan, but simply eating in public is something that some people can’t fathom? How is it that these acts don’t damage the so-called “Muslim” identity that we are so desperate to create but eating in public does? I am deeply saddened by the affairs around me. Intolerance is at an all-time high and I sincerely do not think it has anything to do with Islam as a religion. Because if anyone knows Islam properly, they know that it teaches nothing but love, harmony and tolerance. It teaches sympathy and unity amongst all humans. And it certainly forbids violence and murder. So, my request to everyone out there who thinks that the ban on eating publicly in Ramazan is a good idea, is to really re-examine the strength of your faith, because if seeing people eat around you offends you so much, perhaps you don’t know the first thing about Ramazan and its core objectives. Agree with the blog writer 100%. Kudos to the writer. Indeed, she is brave. world can tell you that,…with proof, in triplicate. sect of Islam, such as Shias, may God protect you. No one else will be able to. Excellent article….and I agree with your view completely. Some years ago while traveling I landed in Kuala Lumpur Malaysia ( an Islamic country ) on the first day of Ramazan …… and I found the side walk cafe’s open during the day and I asked the waitress if it bothered her to serve food during Ramzan and she was surprised as to why I asked such a question….and she said absolutely not although she herself was fasting. Suppose you want to make your child habitual of something doing or refraining from something where all other kids of his age are doing the opposite. How difficult/easy you will find this task. Think about generations, don’t be selfish by thinking only for yourself. “Environment” is very important for all of us. A journey of a 1000 miles begins with that first step. So the author has taken that step. Towards building awareness. There is nothing selfish or personal about what the author of the blog wrote. There is nothing selfish thinking about the welfare of the very old and the infirm. DAILY INTAKE, through out the day, of various medications. Just to stay alive. There is nothing selfish thinking about the very young, forced to keep rosas. There is nothing selfish thinking about people who are not Muslims. Are full citizens. And cannot be forced to go hungry all day or beaten to death if caught drinking water. Majority ‘religious’ norms and observances of an Islamic country CANNOT be forced upon it’s minority non Muslims citizens. Otherwise it is a kingdom, an absolute monarchy. And no one in the US threatens you or your family FOR FASTING! Is the faith so frail that those fasting shouldn’t suffer the temptations of seeing other people eating or drinking water??? If we want to make our childrens habitual of Fasting then I strongly believe there should be a law to refrain people from eating in public. 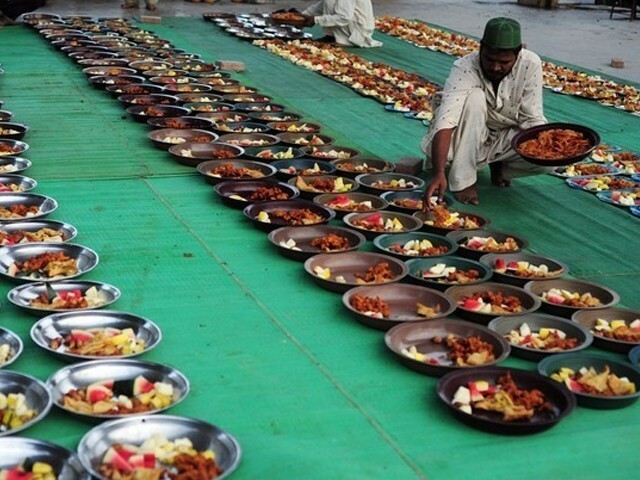 Many Muslim majority countries, Pakistan included, have banned eating in public during Ramazan, with consequences of imprisonment and fine for those who do not comply with the law. This is not in line with Quraanic teachings but simply expresses the will of monarchs and authorities in the country. Fasting renews humans immune system and is for their good more or less followed by all people of Ibrahimic religions. Let the muslims come out of 7th century practice and enlighten thmselves without imposing their will on others having different interpretation of the ancient rituals. We are all travellers in this world, our dstiny being the life aftr death. There is something called Dunning – Kruger effect i.e. people with generally low ability have an illusion of believing themselves to be superior. Unfortunately, many people around us suffer with that. We need awareness around our own failings to not become victim of this. However, this effect combined with religious beliefs gives you a disaster like “ban on public eating in Ramazan”. I know people in offices who go to washroom just to have a sip of water, just so that they don’t offend “FASTING” muslims.